AC/DC Desktop Power Adapters offer MTBF greater than 300,000 hours. 120W TDM120 Series AC/DC Power Adapters are offered with 12V, 15V, 18V, 19V, 20V, 24V or 48V outputs. Units are available in Class I which come with an IEC 320/C14 or IEC 320/C6 AC inlet and class II with IEC 320/C18 or IEC 320/C8 AC inlet. Housed in a black-colored plastic enclosure with LED power indicator, products come in 6.62 x 2.60 x 1.54 in. size. Operated in a temperature range of 0°C to +40°C, power adapters provide earth leakage current less than 300µA. TRUMPower has released the new 120W TDM120 series of low cost medical grade AC/DC desktop power adapters to its product line-up. Using the power supply ensures compliance to the latest IEC/EN 60601-1-2 4th edition medical EMC standards. The TDM120 Class I units come with an IEC 320/C14 or IEC 320/C6 AC inlet and class II units are furnished with an IEC 320/C18 or IEC 320/C8 AC inlet. The power adapters are available with 12V, 15V, 18V, 19V, 20V, 24V or 48V outputs, making them suitable for a wide range of applications. Standard output plug for the 12V and 15V models is a 4 pin DIN. The 18V-48V models are equipped with a 2.5 x 5.5 x 9.5mm barrel connector as the standard. TRUMPower offers additional connector and cable options upon request. The TDM120 series is approved by UL/cUL and TUV to the latest medical standards, including IEC/EN/UL 60601-1 Edition 3.1, ANSI/AAMI ES 60601-1: 2012, CSA-C22.2 No. 60601-1: 2014. The power adapter complies with IEC/EN 60601-1-2 4th edition medical EMC and immunity standards including EN 55011/FCC/CISPR 11 class B (conducted and radiated emissions), EN 61000-3-2, EN 61000-3-3, EN 61000-4-2 (ESD at 15kV air and 8kV contact), EN 61000-4-3, EN 61000-4-4, EN 61000-4-5, EN 61000-4-8, EN 61000-4-11. With efficiency of 87% minimum @ full load, the TDM120 series satisfies CEC & DOE level VI and ErP stage II requirements. It carries CE marking, is RoHS compliant and has PSE approval as well. Packaged in a low profile black-colored plastic enclosure with LED power indicator, the unit has a size of 6.62 x 2.60 x 1.54 inches. 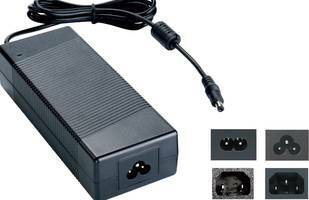 The 2 MOPP rated power adapter accepts a 100 to 240 VAC continuous input range and 0.95 power factor. Withstand voltage is specified at 4,000 VAC from input to output (2 x MOPP). With earth leakage current being lower than 300µA @ 264 VAC, the TDM120 power adapter can operate at an ambient temperature range of 0°C to +40°C and operating humidity spans from 20%-80% non-condensing. Its MTBF is higher than 300,000 hours at full load and 25°C ambient, calculated per Telecordia SR-332. With no load power consumption <0.15W, the power supply is fully protected against over voltage, over temperature, over current, and short circuit conditions. The TDM120 is competitively priced in OEM quantities. For more detailed information, please visit http://www.trumpower.com/library/tdm120.pdf or email sales@trumpower.com. TRUMPower has been delivering high quality medical and industrial grade AC/DC switching power supplies and DC/DC converters for more than 25 years. The company’s medical grade power supplies range from 4W to 1200W and its line of ITE grade AC/DC power supplies range from 3W to 1400W in wall mount, desktop, open frame, and ATX PC form factors. TRUMPower can accommodate to OEM’s needs, whether they are low volume standard power supplies or high volume custom products by providing excellent service, reliable and cost-effective power solutions. As a result, it has been an ever-trustable source of power supplies for many satisfied customers over the years.